Bacterium that have become highly resistant to antibiotics. 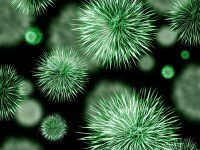 Bacterial resistance to antibiotics is growing day by day in both community and hospital settings, with a significant increase in infectious rates and death counts along with considerable financial burden to the government and community. Resistance can appear spontaneously due to random mutations; or more commonly following gradual build up over time, or because of the misuse of antibiotics or antimicrobials. The AMR study commissioned by the UK Prime Minister, released on March 2016, which predicted that by 2050, we’ll see over 10 MILLION DEATHS annually from so-called “super germs.” This would make antibiotic resistance a MORE DEADLY problem than cancer. Federal health officials reported that at least two million Americans fall ill from antibiotic-resistant bacteria every year and that at least 23,000 die from those infections. Infectious disease doctors have long warned of antibiotic resistance. Conventional antibiotics are getting progressively more ineffective as a consequence of resistance. The need for new antibiotics still does not cover the increasing prevalence of antibiotic-resistant bacterial infections. Luckily there are natural medicines and herbs that work against fighting these bacteria strains. Andrographis, Golden Seal, Echinacea & garlic are just some of the herbs we prescribe to patients to treat these infections, aswell as Elderberry which is found in many of our herbal teas that we have in our clinic.